This is a very clever and convincing production cabinet, which can also be used for vanishing or changing items. Based on the Pro-Van Cabinet by Jack Hughes. This is a handsomely decorated and sturdy wooden model. The apparatus comprises of a "portfolio" type cabinet and a stand. The cabinet is in the form of a hinged panel. 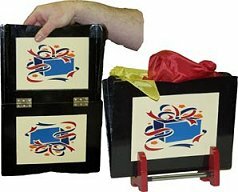 The rear panel has a secret load compartment which can be freely handled by the magician so the audience will never suspect a thing. 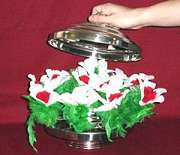 The cabinet measures approximately 8 x 10 inches and holds quite a large load of silks, spring flowers, rubber or foam fruit or anything you desire.